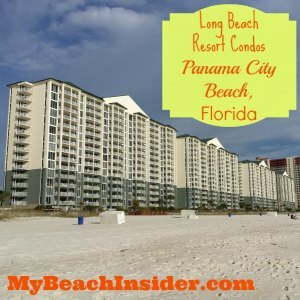 Long Beach Resort is located in Panama City Beach, Florida and has four different condominium tower buildings. Towers 2 and 3 are virtually identical and have 6 units on each of 14 floors in each building. Tower 1 has 7 units on floors 1 through 13 and 6 units on floor 14. Tower 4 has 7 units on floors 1-11 and 6 units on floors 12-14. 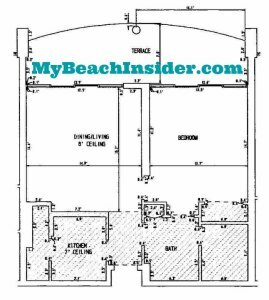 Despite the different building configurations, there are only 5 significantly different floor plans (and sometimes a mirrored version) available in the entire resort. They range from an efficiency to a 3 bedroom/3 bathroom layout. 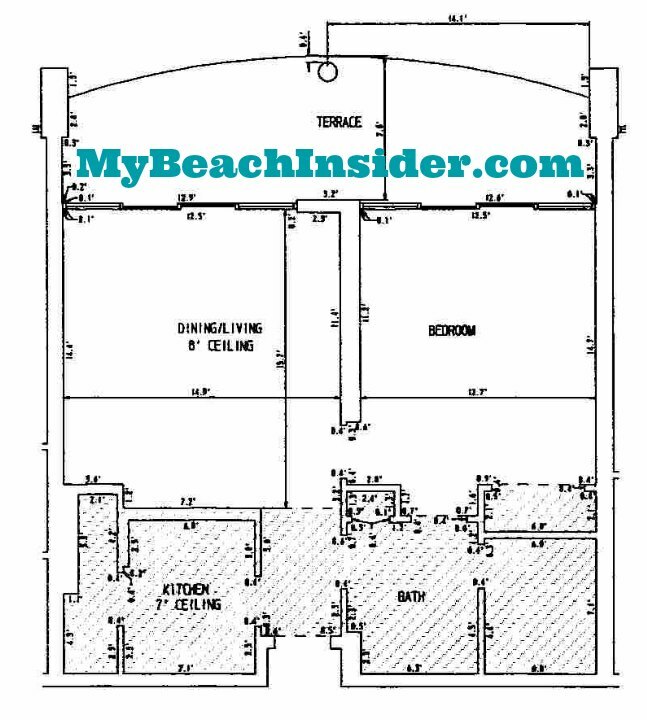 The efficiency floor plans can be found in Long Beach Resort condo towers 1 and 4. In tower 1, they can be found in units 100E through 1300E which are on the east side of the building. In tower 4, they can be found in units 107E through units 1107E on the west side of the building. These units are 425 sq ft in size, excluding the balcony. As you walk into the tower 4 version of the floor plan, you’ll see the bedroom/living area straight ahead. To your left is a small kitchenette which usually includes a mini-fridge, sink and microwave. Just past that is a small closet. Continuing further into the room, you’ll see the balcony straight ahead. If you look to your right as soon as you enter the unit, you’ll see a closet on the far wall. If you turn right and walk to that closet, you’ll see the entrance to the bathroom on your right. The bathroom has a stand up shower, toilet, sink and a utility closet that normally houses a stacked washer/dryer combo. The tower 1 version is an exact mirror of the tower 4 floor plan described above. This particular one bedroom/one bathroom floor plan can be found in towers 1, 2 and 3 in units that end in 02 and 05. The unit described below is the 02 version and the 05 version is a mirrored copy of this plan. 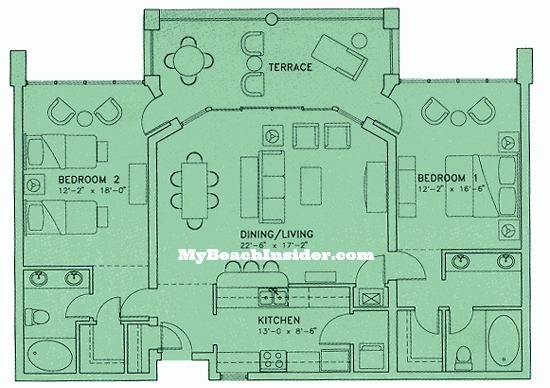 These floor plans are 725 sq ft which does not include the balcony square footage. As you enter this floor plan, you’ll see the kitchen on your right. On the far wall of the kitchen is a walk in utility and storage closet. As you continue to walk into the unit, you’ll see the dining/living area. On the far wall is a floor to ceiling sliding glass door that opens up to the balcony and a wonderful gulf front view. The kitchen and dining/living room are divided by a breakfast bar. On the right wall of the living/dining room is the door to the gulf front master bedroom. When you walk into the master bedroom, you’ll see a floor to ceiling sliding glass door on your left and an entrance to the master bathroom on your right. Just past the entrance to the master bathroom is a standard closet. When you enter the master bathroom, you’ll be in the dressing area which has a his and her sink, as well as a closet that houses a stacked washer and dryer. On your left is a door that opens up into a small area with a toilet and a shower/tub combo in most units. 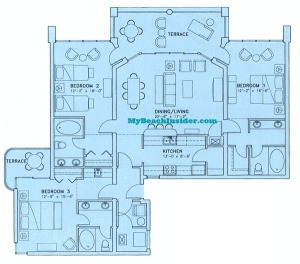 The second one bedroom/one bathroom floor plan can be found in tower 4 and has a slightly different layout. It can be found in units that end in 02 and 05 and the unit described is the 02 version. The 05 version is a mirror copy. 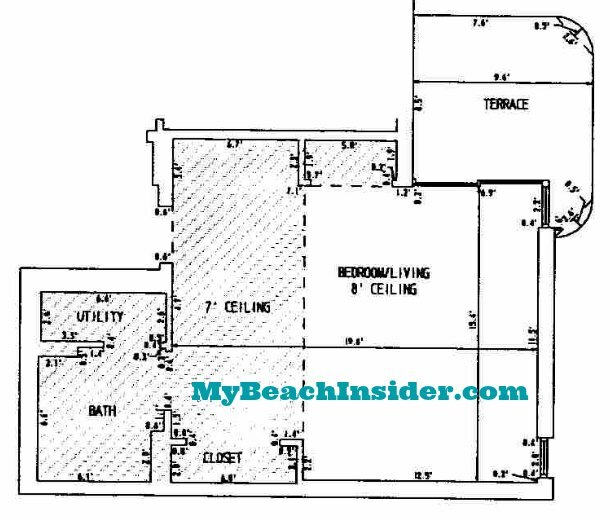 These floor plans are 725 sq ft and that doesn’t include the balcony. As you enter the unit, you’ll see the kitchen on your left. On the far side of the kitchen, you’ll see a utility/storage closet that houses the AC unit, water heater and washer/dryer. On the right, as you enter the unit, you’ll find the bathroom. The first room of the bathroom is more of a dressing area with a dual sinks on your right. On your left is a small linen closet and an entrance to the gulf front master bedroom. Straight ahead is a door to the area with both the toilet and the shower/tub combo. Back in the entry, as you enter the unit and look straight ahead you’ll see the dining/living area. The living/dining area is separated from the kitchen by a breakfast bar. On the far wall of the dining/living area you’ll see a sliding glass door and floor to ceiling windows that lead out to a massive gulf front balcony. On the right wall of the living/dining area, just past the entry, you’ll see a door to the gulf front master bedroom. Once you enter the bedroom you’ll see a sliding glass door on your left that leads out to the gulf front balcony and floor to ceiling windows on either side. On your right, you’ll see the master bedroom entrance to the bathroom previously described. Just past the entrance to the bathroom is a standard closet. 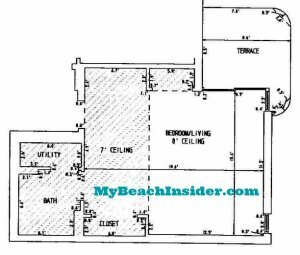 There are two versions of the two bedroom/two bathroom floor plans in Long Beach Resort, but in reality they are just mirror copies of each other. 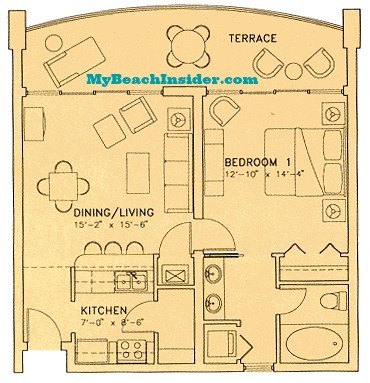 The floor plan described below can be found in units that end in 03 and the mirrored version can be found in units that end in 04. 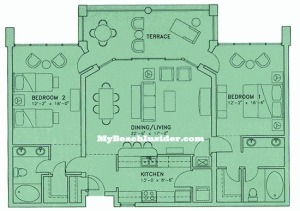 This floor plan is 1,326 square feet and is in all four towers. They can also be found in tower 1 in units 100-1300 and tower 4 units 107-1107 which are slightly smaller at 1,304 sq ft.
As you enter the unit, you’ll see a closet on your left after you closet the entry door. On the right is the kitchen, which has a utility and storage closet at the far end. Straight ahead is the living/dining area which is separated from the kitchen by a breakfast bar and a wall. The living/dining area is spacious and the far wall has a floor to ceiling sliding glass door with floor to ceiling windows on either side of it. This leads out onto the expansive balcony. Before you enter the living/dining area, there is a door on your left that leads to the first gulf front master bedroom. As you enter this room, you’ll see the bathroom straight ahead and a walk-in closet on your left. The master bathroom has his and her sinks, a toilet and a shower/tub combo in most units. The bedroom has floor to ceiling windows on the gulf front wall and also has a slanted wall that has a door that leads to the balcony. It will be on your right as you look out the amazing windows to see the beach front view. The other gulf front master bedroom is on the opposite side of the unit. You’ll find it through the door on the right wall of the living/dining area. As you enter the second gulf front master bedroom, a dressing area is straight ahead with his and her sinks. On the right, you’ll first see a walk-in closet followed by a second door that leads to a room with a toilet and shower/tub combo in most units. If you take a left when you enter the master bedroom, you’ll see the main bedroom area. On the far wall are floor to ceiling windows with an amazing gulf view and to the left of that is a door that leads to the balcony. The three bedroom/three bathroom floor plans are found on the east and west end of each tower. It can be found in tower 1 in unit 1400 and units 106 through 1406 (there are no units that end in 01 in tower 1). It can be found in towers 2 and 3 in units 100-1400 and units 106-1406. It can be found in tower 4 in units 101 through 1401 and units 1206 through 1406. 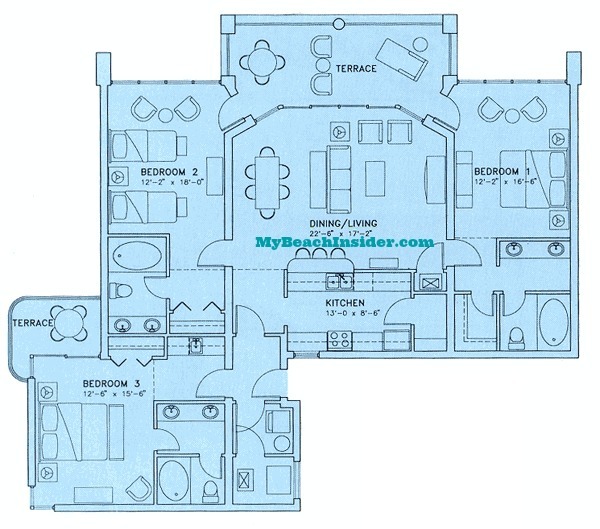 The version described in the text below is the typical 01 or eastern end unit floor plan and the 06 or western end unit floor plan is a mirrored copy. These units are 1,769 square feet. As you enter the unit, you’ll see a large utility and storage closet to your left. Straight ahead is a door that leads to an efficiency type unit. As you enter the efficiency area, you’ll see a small kitchenette on your right which normally has a sink, mini-fridge and a microwave in most units. Just past that on your right is a standard closet. Just past the closet on the right wall is a sliding glass door that leads to a small balcony area. This is in the main bedroom area. On the northeast corner of the bedroom are two small windows. As you look back toward the entrance to the efficiency from the balcony, you’ll see a door to the bathroom on the opposite side of the room. The door leads into the dressing area with his and her sinks. There will be a door on your right within the dressing area that leads to a small room with a toilet and a shower/tub combo. Back where we entered the main unit, you can take a right through a door way and enter the main part of the unit. As you walk through the door, you’ll see the kitchen immediately on your right. On the far end of the kitchen is a utility and storage closet. Continuing into the unit, the dining/living area is straight ahead. On the far wall is a sliding glass door that leads out to the gulf front balcony with floor to ceiling glass windows on either side. On the left wall of the living room is the entrance to the first gulf front master bedroom. As you enter the bedroom, straight ahead you’ll see the entrance to the bathroom. A closet will be on your left. This bathroom has his and her sinks, a toilet and a shower/tub combo. Back in the master bedroom, you’ll see floor to ceiling glass windows on the gulf front wall. There is also an door that leads to the gulf front balcony on the right side of the bedroom when you’re looking at the gulf. Back in the living room, you’ll notice a doorway to the second gulf front master bedroom on the wall on the right side of the room. As you enter this bedroom, you’ll see a closet on your right, a dressing room with his and her sinks straight ahead, and the bedroom to your left. In the dressing room, there is a door on your right that leads to a separate room with a toilet and a shower/tub combo. Back in the bedroom, you’ll see floor to ceiling windows on the gulf front wall. There is also a door that leads to the gulf front balcony on the left side of this master bedroom. Ready To Visit Panama City Beach? Check Out The Rest Of Our Site! 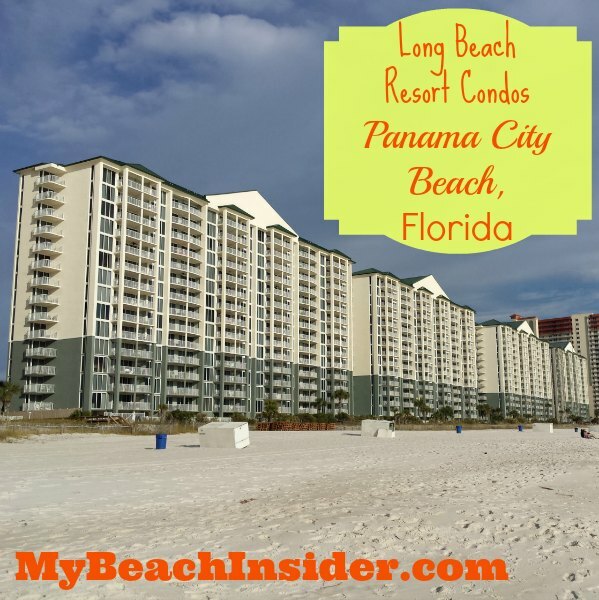 If you’re ready to visit Panama City Beach, Florida, make sure to check out the rest of MyBeachInsider.com. In addition to sharing information about all of the local condos, we share only what an insider would know about where to eat, where head to the beach and where entertain your friends and family. Lance what happened to your site? You haven’t been keeping it up. It is so awesome for those of us who invest in PCB! 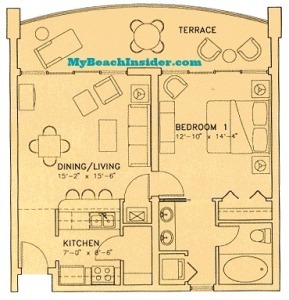 I was wondering if you could send me the dimensions of the two bedroom units at Sunrise Beach? Hi Ana. Sorry, life got busy and this project hit the back burner. Hopefully I can add Sunrise Beach soon.